Hi, my name’s Chris and I’m a volunteer team member for Chesterfield Animal Rescue. 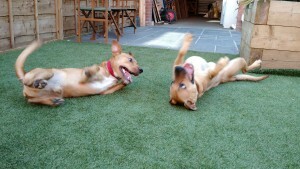 Yesterday I brought home Mylo as a foster to live with me and my rescue dog Millie – who’s also from C.A.R. – until he finds his forever home or a long term foster and I’d like to tell you a little bit about him. He seemed a relatively nervous dog and wasn’t really sure who this man (me) he’d only seen a few times before was putting on his lead and walking him towards the car but by the time we’d made the short journey home I think he’d realised I wanted to be his friend and the nervous barking displays subsided very quickly. Oh and he also travels well, sitting quietly in the boot the whole journey. Mylo is still a young dog at only 16 months old and so still has a few manners to learn about how to behave when in the company of other dogs, cue Millie. Now, she is also relatively young and is a bundle of energy so she loves to play, roll around and play chase so it was going to be interesting. I found that Mylo takes his lead very much from Millie. 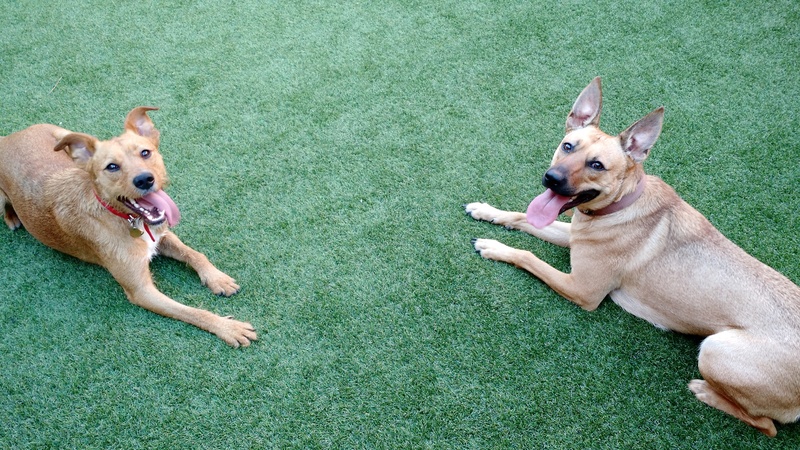 If she is running around he’ll happily play chase as either the chaser or chasee, he certainly doesn’t seem to lack confidence around other dogs. However, if she is taking some time to chill he’ll do the same and they’ll lay sunbathing in the garden. I imagine he would be the same with any dog, they show him how to behave well and he’ll follow suit. Inside the house Mylo is a delight and he instantly seems to switch to indoor mode. He barely moves faster than a slow trot around the house so there is no worry of things being knocked over or damaged. He seems extremely content to be sat at my feet whilst I watch TV and should he be looking a little bored or restless a chew toy does the trick nicely; his favourites at the moment are a Kong toy and a deer antler. Speaking of toys, look at these manners. 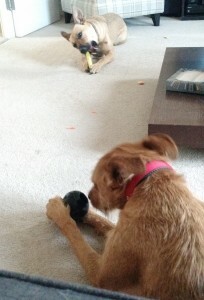 Both dogs happily chewing on toys (albeit each others), respecting each others space. He’s nothing if not a quick learner! I’m not sure if Mylo is still a little under confident in his new environment or whether it is his nature but he will barely stray far from my sight often coming back to check in if he does adventure out of sight. Millie often tries to entice Mylo to venture out of the current room and as his confidence grows he is starting to explore the house with Millie but it’s still nice that he comes back to check in regularly. 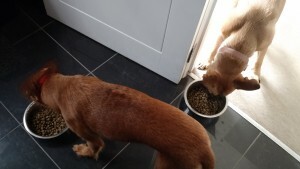 After the first evening of excitement I decided it was dinner time for me and the dogs. Millie eats in the kitchen whilst I’m cooking and so I thought I’d see how Mylo would behave under the same circumstances. 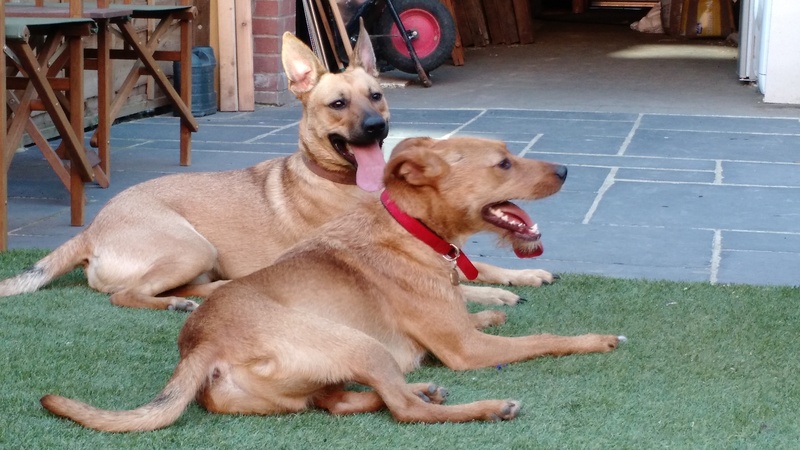 Bingo, 2 dogs eating next to each other and completely comfortable in each others company. Mylo showed no signs of food protection/aggression and also understood which food was his and which was Millies. A lunch time treat the next day consisted of a detastix for each dog. I’ve taught Millie that manners are everything and before a door is opened or a treat is given she must say please by sitting. 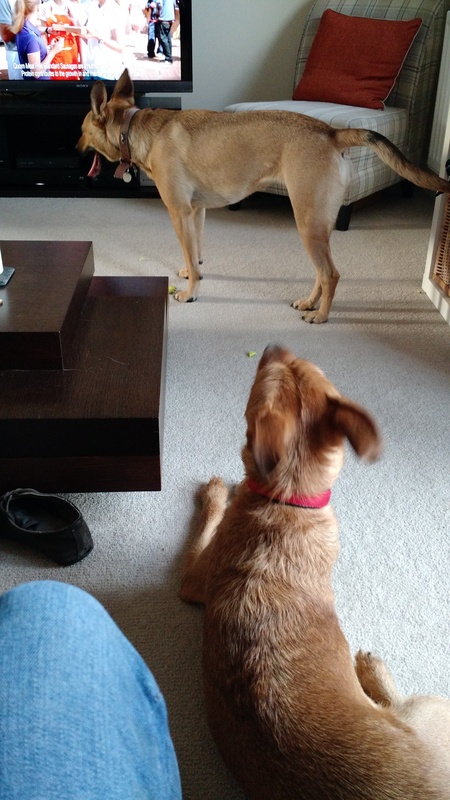 Mylo is also learning the same manners and quickly too. Have a look at the video and notice how he sits to say please, doesn’t try to get Millie’s treat and waits till he is given his. Who ever takes home this lovely boy will have a great foundation to work with thanks to the care he has been given by the team members at C.A.R. – even if I do say so myself! I’m not sure how long Mylo will be with me but hopefully it won’t be long as this boy deserves a great forever home although it will be my pleasure to foster him until someone else comes along. If you’re interested in applying to adopt or foster Mylo use the form on his page. You can also hee more photos and videos of Mylo on his adoption page or Facebook album.